How to Fix dv9000 No Video No Wireless issues Nvidia Video Chip Separating from the system board. Copper shim, bga re-flow, no video fix hp DV9000. This will also give you symptoms of no wireless connectivity or loosing the wireless card.. or the system will loose the dvd/cd rom before the chip will entirely go out ... lots of different problems can be attributed to this issue .. they all have something to do with the Nvidia Chipset. Also will exhibit 3 beeps and no video, or continuous power recycle with no video, or turn on and shut down 5 or 10 seconds later. This issue affects HP Pavilion dv2000, dv6000, dv9000, tx1000, Compaq Presario V3000, V6000, and Compaq F700 Series notebooks. If you really decide to buy new SEND ME YOU’RE OLD DEAD COMPUTER I WILL TAKE IT!!!! After Part 4 of the DV9000 post or the last post of the other DV tear-down guides, you will have access to the system board ... you will need to take off the Heat Sink and fan assembly if you have made it this far you should be able to do that with no problem.. as well I would remove the (AMD / or Intel) processor from the ZIF socket.. and you will have this. These are Actual pictures of the DV6000 system board so your will look a little different ... but rest assured this has been tested to work on several dv9000 system boards. To be honest it is not Nvidia's issues don’t blame them it is actually the manufacturing process of the system board that is at fault the chip is fine and works great. During assembly the chip is attached to the system board via BGA soldering (Ball Grid Array) because of the heat generated by the video chip if heat is not wicked away properly and the proper amount of flux that was used the small solder joints under the chip will melt and eventually separate and no longer have contact between the chip and the system board. 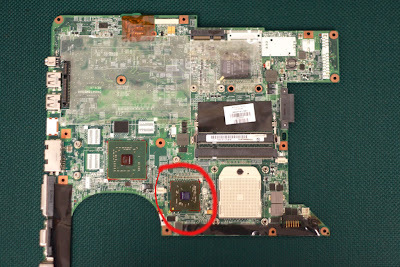 Do not try to remove the red compound that has been placed around the video chip.. it is very hard and you may end up damaging the system board in the process. This procedure has worked with the red compound intact and on boards that do not have the compound. Remove the pad that goes between the heat sink and the video chip ... now you definitely will see a gap between the chip and the heat sink when you reinstall the heat sink ... make sure you use thermal paste on the processor.. We don't want to damage that... BTW clean all the hard gooped up thermal compound they used its crap.. use Artic Silver the best stuff.. Connect the fan so you know it’s on. Let cool.... for 30 min or more ... and test .. Just like above... if it works reassemble with your copper between the heat sink.. and your computer can be used... Waaahooo. 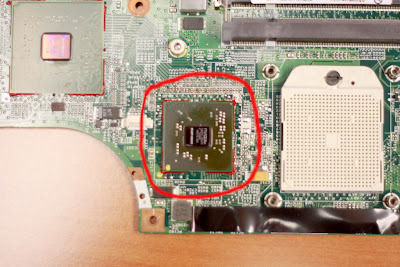 Do you also use thermal paste on the nforce chip?? I usually leave the nForce chip with its thermal compound I don't change that out. 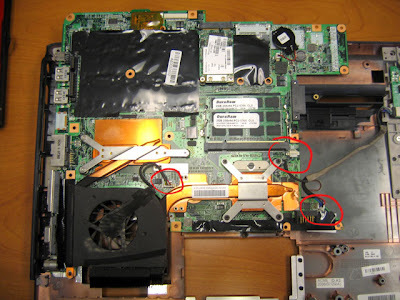 If you are not getting video now after tearing the laptop apart I would double check all of the connections before re-flowing the chip and if every thing is fine there you may have to go through the re-flow process. Hello, its me again. I reflowed the GPU and its up again, but know every time it boots and when initializing windows display blue screen... any ideas?? UN-FREAKING BELIEVABLE! I can't tell you how much you rock! Everything started happening about 3 days ago...I consider myself computer geeked out as I used to build my own desktops and I took this one apart last year to see how she ticked, but I could not figure out what the deal was...The only thing I knew was that something bad was going down as it would shut down randomly (BSOD)...Then Sunday hit, and BAM! Dead. Nothing but a black screen with flickering...I am in medical school with 2 weeks of classes left and I assumed I was out 2Gs due to this (this comp, dv9500 CTO cost around that). Well, I came across your site and gave it a go...And, I can say that I've had her up ALL DAY and I swear that this thing is cooler than baby bottle milk! So, for all those wondering - IT WORKS. I used thermal grease and TWO 1974 pennies as this model is diff than the dv9000. I donated $10 because even if it goes out again next week, I was still able to get it running and transfer files I wanted to an external. NOTE! Due to constant taking apart I lost my keyboard to the battle, so this is NOT for the inexperienced and if you are a newb, TAKE YOUR TIME! Im running a USB keyboard, but I could care less thanks to CE!! I forgot to mention my specs...according to PC Wizard 2010 I am running at ~ 49 degrees on GPU (NVidia 8600M GS...With 720P .avi playing on Windows Media, Firefox open, and Outlook 2007 - 54 degrees C is where it leveled off! AMAZING! I have 2 motherboards that i fixed, anyway 1 of them works just fine, had the computer up for 2 days now, but the other motherboard just work for a couple of restarts then its black again, maby i dont come up in the right temperature when i heat it up, i dont know. If I was a woman in a fertile age, I would gladly bear your children so they would spread more wisdom. I fixed a dead DV9000 a few minutes ago and I have a couple other dead netbooks and laptops that will get the same treatment. Thanx workt great for me to! Can't belive that i had have this notebook in my basement for two years now. But now is it running again! I work at Notebook Tek in NY we get a lot of machines to reflow that are damaged from people melting their boards and also from people using new pennies. So head the warnings of this post about zinc pennies and risks of ruining the board. I love this post by the way great information. If any body needs a BGA reflow check out our site at www.notebooktek.com we do them all the time. You can alway call us also if you have any questions. Too bad HP wouldn't just fix all of them for us.